In most cases, your dentist can place your dental implant. The conventional process can take from three to six months. First, the dentist places the dental implant, which is left for three to six months to heal and integrate with the jawbone. 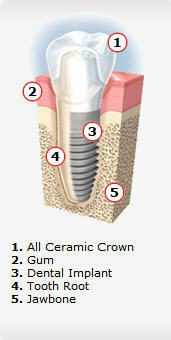 During the healing period, you may be given a temporary prosthesis until the permanent crown is put in place. With any surgery, there can be some discomfort. Placing one implant normally causes less discomfort then placing several. Anesthesia and patient sedation are commonly administered to help reduce any discomfort during the dental implant process. Most patients report that they were much more comfortable following the procedure than they had anticipated. Your doctor will prescribe medications to ease any discomfort that may occur. .